Small Animal Bandaging, Casting, and Splinting Techniques is a well-illustrated how-to manual covering common bandaging methods used to support and manage both soft tissue and orthopedic conditions in small animal patients. This highly practical book offers step-by-step procedures with accompanying photographs to aid in the secure and effective application of bandages, casts, and splints, with coverage encompassing indications, aftercare, advantages, and potential complications for each technique. 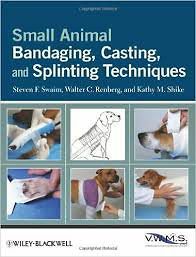 Small Animal Bandaging, Casting, and Splinting Techniques is an indispensable guide for busy veterinary technicians and nurses, as well as veterinarians and veterinary students.